The Phoenix is a mythical creature with a powerful message. It is a message of Hope and Renewal; an homage to the cycle of Life and Death. In almost every culture on the globe, reference has been made to a creature that displays similar characteristics to that of the Phoenix. Although the actual image of each creature may vary, they all carry with them the same symbolic meaning. The traditional legend of the Phoenix is of Greek origin and speaks to a bird that is unable to die. Every time the Phoenix is destroyed by the flames, it emerges from the ashes, stronger, faster, and more powerful than before. This idea resonated with Early Christians. At a time when they were being persecuted for their faith, they sought comfort in the legend of the Phoenix and soon, the bird was adopted as a Christian icon and became symbolic of The Resurrection of Jesus Christ. Phoenix designs are usually vibrant and lively, but that is not to say that it is all about color and flare. When these designs are intricate, then the real beauty of the piece comes to the forefront. You can add as many elements as you desire to your Phoenix piece, but most artists suggest that it is best to keep it simple and let the image of the bird and its fiery tail feathers carry the weight of the design. When it comes to Phoenix designs, size matters; too small and the real value of your design will be lost (remember this is an intricate piece). Too large and… well there is no such thing as a tattoo that is too large. Sometimes the most powerful image is the one with the least amount of color. Although images of the Phoenix are traditionally known to be vibrant and fiery, it is not uncommon to see tribal designs that lack any hint of color. These designs are usually created to focus on the intricate details of the Phoenix's body and are meant to evoke stronger emotional responses and hint to deeper spiritual connections. Tribal Phoenix Tattoos represent beauty, Grace, Power, Perseverance, Passion, and Renewal. You can mix mythologies by incorporating elements that are native to a particular region in order to show your spiritual link with that group of people. Known also as Yin Yang Tattoos, these designs represent the dual nature of mankind. In the Chinese culture, the Dragon represents Yang, the powerful and passionate forces of the universe. The Dragon is usually the embodiment of masculinity and like the Sun, it is untameable and wild (the white half). On the other hand, Yin is the calm voice within us all. Yin, as represented by the Phoenix, is steady and rational. In this tradition, the Phoenix refers to the phases of the Moon and symbolizes Femininity, Beauty, and Grace. These designs speak to the need to find balance between the opposing forces within ourselves. The powerful Phoenix rises out of utter chaos and complete destruction, having been refined by the torturous heat. This design has deep metaphoric meaning and speaks to your ability to withstand the harshest conditions and emerge a better, stronger person. 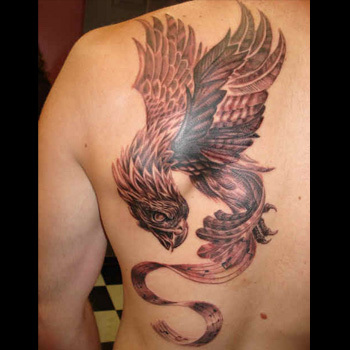 A Rising Phoenix Tattoo is symbolic of your tough nature and never-quit attitude towards Life. The design is the emblem of a fiery survivor. A Rising Phoenix never dies; it is simply renewed by the circumstances that were designed to destroy it. Showing off your undefeatable spirit with a great design of a Phoenix can be a tricky undertaking. With an impressive tail of flames, a Phoenix design creates a powerful image, which - if not carefully crafted - can be easily and unfortunately turned into a tragic piece of body art. Placement and Purpose are critical parameters to consider; even the most inspirational tattoo can lose its oomph if placed in a spot that does not maximize its effect. Invest the time needed to create a design that you will be proud to sport twenty minutes or twenty years from now. Need inspiration? Then our team of experts can help. Take advantage of our Custom Design Service and let one of our artists create the perfect design for your needs.